How do you find the right people for the right job? How do you know the employee will be effective and productive in the long run? Hiring good employees and ensuring that you get the right people in the right job is difficult. Whether a big or small company must always take necessary steps to try and make sure that they are hiring the best employee for the position available. Here are seven proven steps you can implement to hire the right people in your organization. Writing a great job description is a first step towards attracting top talent to join your company. A clear job description will effectively communicate your company’s requirements and available positions for applicants. This may sound very basic, but many companies fail to develop good and clear job descriptions. Success profile will help you determine the maximum fit between the employee and skills needed for a particular role. This will also help you to identify the profile of an ideal employee for key positions in your organization. You can accurately identify the competencies and skill needed for the job. Don’t hesitate to compare the skills of the candidate with your existing employees. Of course, social media has become a leading platform for posting job openings. Using Social Media with recruitment is a great formula. Applicants’ quality from social media tends to be higher and genuine too. Use LinkedIn for recruiting. Once you post your ad on social media platforms you will start receiving resumes. Don’t forget to attend job seekers applying through your website. Collect relevant candidates’ data for quick reviewing of resumes. Integrate career page of your company's website with various tools available to collect candidate’s data so that you don’t miss out the potential candidate. Knowing what you're looking for in terms of experience, education and skills will help you weed through the resumes quickly and identify potential candidates. Assessments are a vital part of determining candidate’s knowledge. Online assessment software helps inadequate screening, to hire the right candidate without any efforts and extra time. Online pre-employment assessment software is often overlooked, when it could be a very effective tool. The benefit of online testing is you can assess the competencies and skills of the candidates in a more realistic and engaging way. Online testing with immediate reporting helps you to determine whether the applicant should be invited for the personal interview with quick decision making. Resumes don’t speak the reality, and asking questions on the basis of resumes is a big mistake. Anyone can claim to be an expert in almost anything. The only way to see if a candidate is going to work well is to take a test drive. Give the candidate an actual problem or challenge with real work illustrative that the particular position was created to overcome. 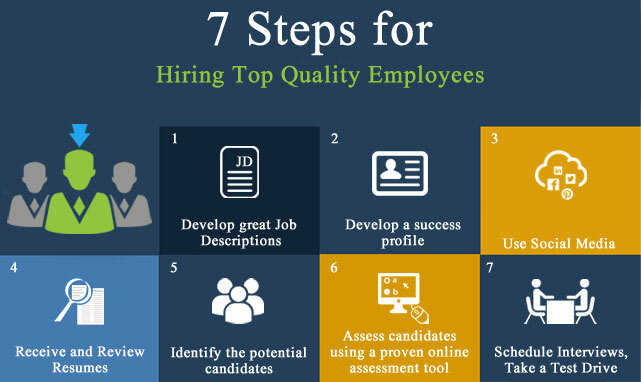 Hiring top quality employees can be a challenge but following a structured process will help you best match the right people to the right jobs in your organization.